As a boy, Dan Serna rode in his uncle's pick-up truck over the family's farms in Texas. But what might have been a cherished pastoral memory, instead became an inspiration. In high school, Dan served as an Information Ranger at Appleton Farms in Ipswich, Massachusetts, where the Trustees of Reservations demonstrated community-supported agriculture by managing a dairy herd and producing grass-fed beef. "I took an A.P. class in economics," Dan says, "to learn more about the business environment." When he returned to Appleton for college summers, he took on finance and marketing projects. To learn more about agriculture itself, he studied at Yale. "Most people don't think of Yale as a big 'aggie' school," Dan explains. "But it has a long history in environmental and agricultural economics — hybrid corn was first developed in New Haven." Dan made his own contributions to Yale's agricultural legacy by getting involved with and eventually leading Food From the Earth, a student advocacy group focused on the university's dining-hall options, which helped start the Yale Sustainable Food Project. "When I started," says Dan, "only ten percent of the food served could be described as 'sustainable.' By the time I left, we he had lifted it to fifty percent." 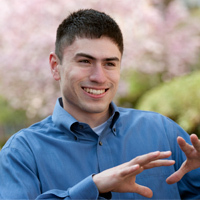 In the summer of 2007, Dan participated in HBS' Summer Ventures in Management Program. "I wanted to leave my comfort zone and interact with people from all over the world and from other industries." Deeply impressed by the experience, Dan applied and was accepted into the HBS MBA program with a two-year deferred admission. In the interim, Dan worked at H.P. Hood, where he brought a recently acquired milk-processing plant up to Hood standards (and resolved the mystery of "missing" milk output — it turns out the gallon jugs were 1.5 ounces too big). Dan also spent time at AgriMark, a dairy co-operative of 1,400 farmers, where he worked on futures and options-trading strategies, global sales, and capital budget processes. At HBS, Dan was initially, "skeptical about how structured the Required Curriculum year is, with fixed classes and assigned seating — like preschool. Coming after the freedom of college, it seems restrictive. But it's all worth it, because we get to know each other so deeply." Dan links section bonds to lessons in leadership. "Even in a functional class, such as Financial Reporting & Control — it's not at all just about accounting. We always talk about the rules in terms of the gray areas, the boundaries. Good answers don't come from knowledge, but through weighing so many options. Your functional expertise is not enough. You have to have conversations to get to the best decisions. You rely on each other to find the best path forward." Dan is looking for a summer internship that combines food, agriculture, and finance, "probably in the U.S., but maybe in Latin America." He expects to look for that same combination in his first position after graduation. "I'm interested in a general management role, in responsibilities that help me develop others. Leadership is about empowering others, about making others better as a result of your presence. That's what we live at HBS."